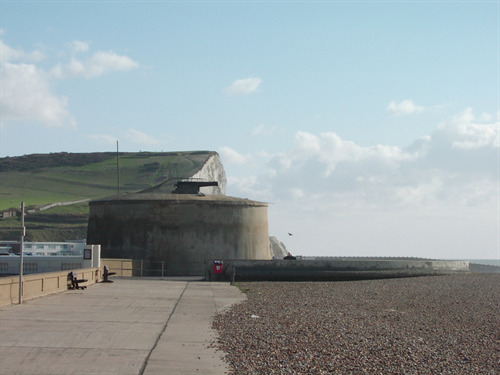 Seaford’s Martello Tower, located at the far eastern end of Seaford seafront, is no.74 of an original 103 small defensive forts built in the 19th century across the British Empire during the French Revolutionary Wars. Martello Tower is leased out to Seaford Museum, with a deceptive 5,000 square feet of display area which includes the roof with cannon, entrance floor with museum shop, the lower floor of the tower and the covered dry moat area. The Museum appeals to all age groups and all members of the family with displays including shops, tableaux and a fascinating collection of material from pre-historic times to the present day. There is a General Store, Dressmakers Parlour, the contents of toy, chemist, ironmonger and photographer's shops as well as Victorian schoolroom, Victorian kitchen and wartime kitchen. There are also collections of domestic appliances covering the first half of the 20th century, office machinery from early typewriters and copiers to computers and a particularly large collection of radios and television sets. There is a working model of Seaford railway station in 1926, wartime memorabilia, two figureheads, information on shipwrecks in the area and information on the changing coast including a video of the most recent sea defence work. THE MUSEUM IS OPEN LIMITED DAYS UNTIL FURTHER NOTICE DUE TO BUILDING WORK FOR IMPROVING DISABLED ACCESS. Admission: Adults £2.00. Members free. Children £1.00. For more information on Seaford Museum, please visit their website www.seafordmuseum.co.uk. Picture: Martello Tower with Seaford Head in the background.